Kalinjar in the Basnda district of Uttar Pradesh has an ancient fort which rises above agricultural countryside. 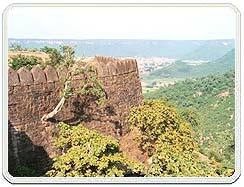 This mighty fort crowning a hill has been the scene of historic battles, for 'Lord of Kalinjar' was a coveted title. The origins of this stronghold are enmeshed in myths which link it to the legendary Kind Bharata, as well as Lord Shiva. 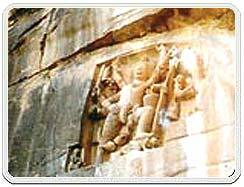 Historically, the fort is associated with the Chandella rulers of Bundelkhand. A polished stone at the entrance of the Neelkanth Temple proclaims the Chandella lineage. The town of Kalinjar was also encircled by ramparts pierced by four gateways. Of these three remain - Kamta Dwar, Panna Dwar and Rewa Dwar. The entrance to the fort is at the foot of the hill. To the right of the path is the Rathore Mahal, built by Akbar in 1583. The steep and stony path to the fort is marked by seven gates - the Alamgir Darwaza, Ganesh Dwar, Chauburji Darwaza, Budha Bhadra Darwaza, Hanuman Dwar, Lal Darwaza and Bara Darwaza. Fine sculpted figures lend their names to these portals. Among places of interest within the fort are Sita Sej, a small cave with a stone bed and pillow once used by hermits; the Patal Ganga or underground Ganga which is a reservoir cut in the rock; the Pandu Kund, where water trickles from horizontal striations in the rocks; the Budha - Budhi taal, whose waters possess great healing powers believed to cure leprosy; the Gajantak Shiva image popularly known as Manduk Bhairon and Bhairvi carved on the rock face ; and the Koti Tirth a large water reservoir, are among important places of pilgrimage at Kalinjar. Kalinjar's holiest shrine is the Neelkanth's Temple built by Parmardideva. The way to the shrine is marked by weathered inscriptions and marvellous carved images of shiva, Kala Bhairon, Ganesha and Hanuman. There are a number of interesting buildings within the precincts of the Kalinjar fort. Most of the grandeur and majesty one presently sees within this fort is due to the Chandela rulers' creative imagination, their highly developed aesthetic sense, and their religious fervor. The Chandelas were great devotees of Lord Shiva, but also showed keen interest in building temples of other deities.The Chandelas were great patrons of art and architecture and the temples within the Kalinjar fort are no exception. The Neelkanth Mahadev Temple located on the western side of the fort is an interesting structure. The front of this temple resembles a cave like opening. The main shrine is scooped out of the rocky hillside, which can be entered through a pillared passage. This temple has an imposing 4.6 feet shivalinga (phallic representation of Lord Shiva) within the cave. Close to the shivalinga cave stand the idols of Bhairav and goddess Parvati (consort of Lord Shiva) made of black stone. One can see a number of images of gods and goddesses and intricately decorated pillars strewn all over within the Kalinjar fort. The vagaries of nature and man have taken their toll but the remnants indicate a synthesis of several ancient cultures and faiths. The palace of the Chandela prince Aman Singh is strewn with sculptures depicting different gods and goddesses. These sculptures are either made of granite or sandstone. Although most of these images are broken, the rich carvings on them attract one towards them. There are a number of Trimurti images depicting the faces of the three principle Hindu gods-Brahma, Vishnu and Shiva-in a composite form. The presence of images of Mahavir (one of the principle deities of Jain religion), and Kamdev (Hindu God of Love) among others, speak of influences from diverse cultures and religious streams. The above-mentioned aspect also leads to the conclusion that the Chandela architecture was not the achievement of artistes from one particular region. Another interesting structure within the boundary of this fort is the Venkat Behari Temple. Though the interior of this temple is in an advance stage of decay, it presents a majestic look from the outside. The hemispheric dome over this temple gives it a odd outlook as domes are generally not used in the traditional Hindu style of temple architecture. There are a number of water tanks or kunds in the fort like the Sita-kund, the Pandu-kund, and the Patal-Kund etc. which are indicative of the Chandela's taste for aquatic resorts and their architectural skills of having such structures built on such high altitudes. Air : The nearest airport is at Khajuraho : 172 k.m. 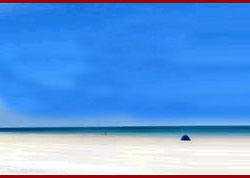 Rail : The nearest railway station is Atarra : 38 km, on the Banda - Satna route, 57 km from Banda Station. Some of the important trains are 1107/1108 Bundelkhand Express, 1449/1550 Mahakaushal Express, 5009, 5010 Chitrakoot Express. Road : Kalinjar is linked by road to all important centres in the region with regular bus services, Some of the major road distances are : Jhansi 256 k.m., Lucknow 285 k.m. Banda 57 k.m. Allahabad 201 k.m. Varanasi 336 k.m., Nagod 58 k.m. Panna 105 k.m., Satna 84 k.m.